Vegetarian’s Delight! 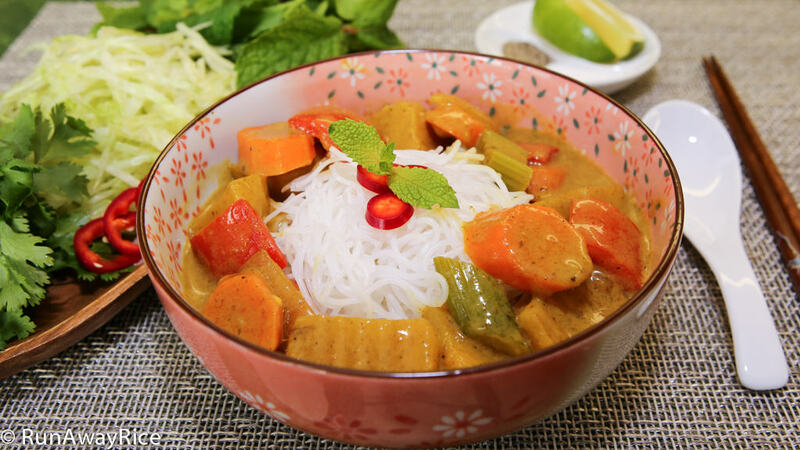 This Vietnamese-style curry is loaded with hearty vegetables–potatoes, sweet potatoes, carrots, celery, red bell pepper and onions and cooked in a savory sauce infused with flavorful curry spices, aromatic lemongrass and creamy coconut milk. Perfectly balanced, it’s not overly rich or heavy. Whether you’re a vegetarian or just looking for a meat-free meal, this dish is guaranteed to be a palette pleaser. Enjoy! 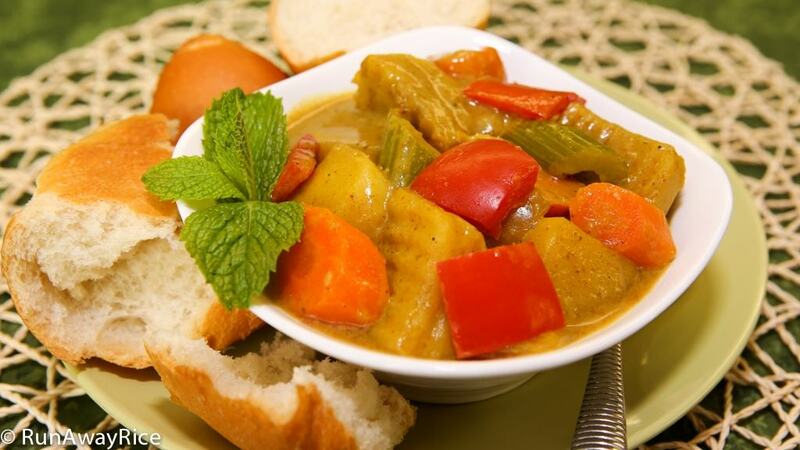 Use any vegetables you like in this recipe. (I like to use seasonal vegetables.) Feel free to substitute the root vegetables with taro root, yams, turnips, etc. I like the potatoes and sweet potatoes cut bigger than the rest of the vegetables. They hold their shape better when cooked. With the bigger pieces, they need to be cooked longer and that’s why we don’t add all of the vegetables at the same time. When preparing potatoes and sweet potatoes, if not cooking them right away, soak them in cool water and a bit of salt to prevent them from oxidizing and turning brown. When ready to use, rinse and drain well. Curry powder comes in many varieties and hotness levels. Some curries are stronger than others and if this your first time cooking with a particular brand, use just half the amount and then adjust accordingly. I purchased my curry powder from my local Vietnamese grocery store. The Indian curry powders work well too, but I find they are a bit stronger. Don’t skip the lemongrass, it adds a lovely aroma to the curry! Substitute the coconut milk with any nut milk, cow’s milk or creamer. The thickener made with corn starch and water can be omitted if you prefer more liquid in your curry–this is great for dipping crusty French bread or serving over rice noodles. 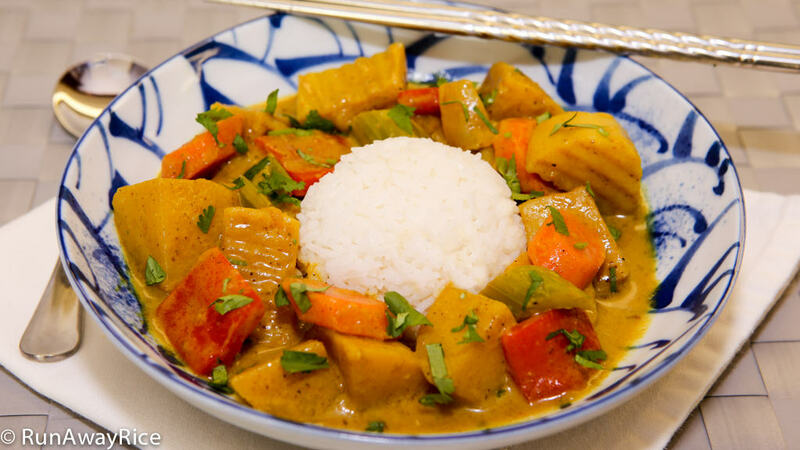 If you enjoyed this recipe, you may also like: Curry Lemongrass Seitan Stir Fry (Mi Can Xao Xa Ot) and Slow Cooker Chicken Curry (Ca Ri Ga). Cut off the ends and remove the skin from onion. Cut the onion half into chunks. Trim off the end of the lemongrass and cut off a 6-inch section. Peel away the tough and dry outer layers of the lemongrass and discard. Cut the stalk in half. Using a pestle, smash the lemongrass slightly. Chop the celery into chunks about 1/2-inch thick. Peel the carrots and cut into chunks a little less than 1/2-inch thick. Remove the seeds from the red bell pepper and cut into bite-sized pieces. Remove the skin from the Yukon potatoes and cut into large chunks. Remove the skin from the sweet potatoes and cut into chunks about the same size as the potatoes. Heat a large pot over Medium High heat and add vegetable oil. Add the onions and lemongrass and stir-fry for 15 seconds. Add the curry powder and stir-fry for another 15 seconds. Add the potatoes and sweet potatoes and combine together. Add the vegetable stock and bay leaves and combine well. Spread out the potatoes so they are all in the liquid. Cover the pot and bring to a boil over High heat. When it comes to a boil, stir everything. Cover the pot and cook on Low heat for 10 minutes. Add the remaining vegetables, coconut milk, soy sauce and sugar and combine together. Cover and cook on Medium heat for 10 minutes. Combine the corn starch and water and stir until smooth. Add the thickener to the curry and gently combine. Continue cooking until the sauce thickens, approximately 3-4 minutes. Remove the bay leaves and lemongrass and discard. Serve the Vegetable Curry while it’s piping hot with crusty French bread, with rice or over rice noodle. Top the Vegetable Curry with freshly ground black pepper and serve with a side of lime wedges and a salt and pepper combo. Made this last night…..AMAZING!!!! My daughter’s boyfriend who is Vietnamese loved it! Thanks for the easy recipe. Looking forward to cooking more of your dishes. If I wanted to remove the potatoes and add tofu instead, what would the process of that be, and what all would change from the original recipe?? Thaaaanks!!! Cut medium-firm tofu into chunks and pan-fry until golden. Then add to the curry when the potatoes are added. Hope that helps. Enjoy!